The Central Government of India recently introduced EWS Reservation. 10% quota is provided for the Economically Weaker Sections (EWS) among General Category candidates in government jobs and educational institutions. This is done by adding clauses for the same in the Indian Constitution (103rd Constitution Amendment Act, 2019). 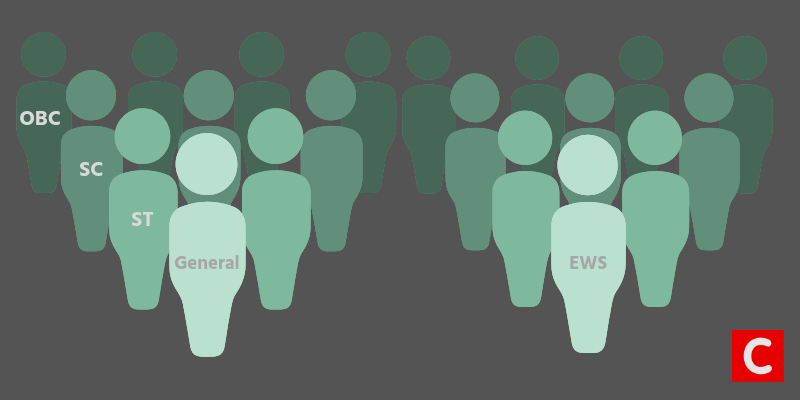 Are you thinking that the 10% Reservation for EWS won’t affect you? Irrespective of your category – General, OBC, SC, or ST – the new quota act (unless struck down by the Supreme Court of India), will change the seats-share accessible to you. Yes, that’s how reservation + merit works in India! The government had said that the reservation of EWS of general category will be given without tampering the existing reservation quotas for SC, ST and OBCs people. Well, that’s only half of the story. Even if your reservation quota is untouched, the merit quota can shrink! Obviously, it will. This is because the new reservation for EWS is carved out from the existing merit quota. 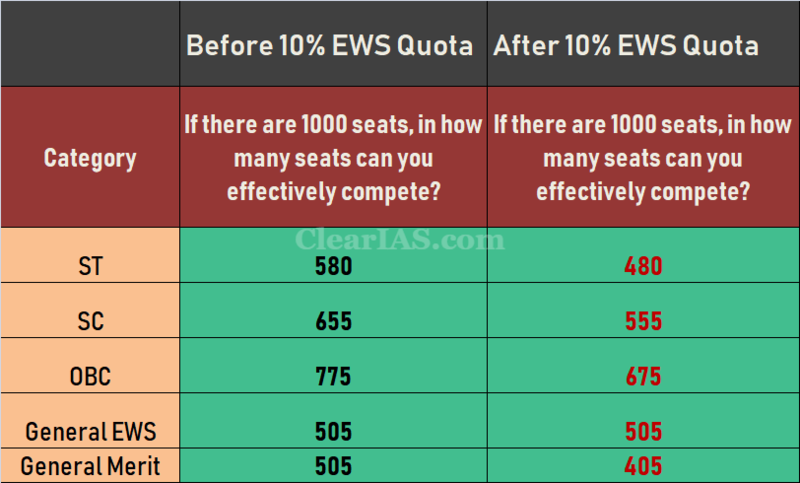 In how many seats can you compete once EWS Reservation Quota is introduced? If you belong to general merit, you can compete only in 40.50% seats as 59.50 seats are reserved. If you are an ST, you can compete in 48% seats (7.5% reservation quota seats+ 40.5% merit seats). On the same lines, SC category candidates can compete in 55.5% seats (15% reservation quota seats+ 40.5% merit seats) while OBC category candidates can target 67.5% seats (27 % reservation quota seats+ 40.5% merit seats). The above analysis shows that irrespective of your category, the number of seats in which each category can compete has come down (except General EWS). If there are 1000 vacancies, General Merit candidates have to be on the top 405 ranks to get a selection (in this case, 595 seats are reserved, which need fewer cutoff marks as well). If you don’t fall under EWS, you will have 10% fewer jobs or seats! Anybody who does not fall under EWS criteria (SC, ST, OBC, or General) will now have 10% fewer jobs to target. For example, OBCs who could earlier target 77.5% seats (27% reserved and 50.5% general merit) will now see their competitive pool coming down to 67.5% (27% reserved and 40.5% general merit). If you were from SC category, earlier you had access to 65.50% seats, but now it is only 55.50%. The pool of ST shrank from 58% to 48%. And most importantly, the merit quota decreased from 50.50% earlier to 40.50%. 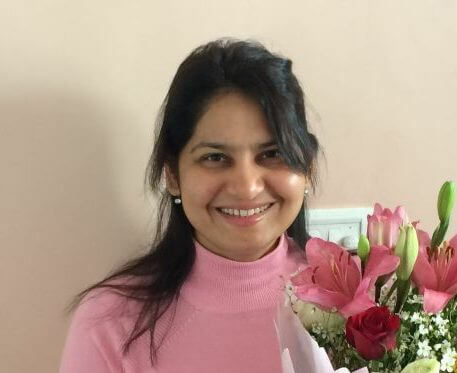 What does the EWS Reservation bring? Inclusion or exclusion? The new changes paint a darker picture of the exclusion aspect. Now, about 60% of seats are excluded from the general merit category. They can’t compete in these seats – because these seats are reserved for somebody else. Everybody – except EWS – lost 10% seats. ST’s are excluded from 52% seats, and SCs are excluded from 44.50% seats. OBC too lost 10% seats, however, their position is relatively better – excluded only from 32.50% seats. Who will gain from EWS reservation (apart from political parties)? Economically weaker sections should be uplifted. There is no second question about that. Whether reservation should be used as a tool for the same – for EWS or any other community – is another question. In fact, it’s time to bring reforms to the Reservation System in India. We have already written about that. Whatever be the case, as the Constitutional Amendment is already made, Economically Weaker Section (EWS) among General category will now get a fixed quota of seats (10%). Into these 10% seats (this will work out only less than100 seats in-case of UPSC Civil Services Exam), other categories – OBC, SC, ST, or General Merit – cannot get into. Further, if the number of attempts and upper age limit is relaxed for General EWS, more candidates from the General category can now write UPSC Prelims (or other government jobs). In case of other categories, though their respective reservation quotas are untouched, the effective seats that can be targeted will come down (as seen from the charts above). How will the EWS quota affect your selection in UPSC Civil Services Exam (CSE)? Cut-offs for General Merit may increase, as there are fewer seats now. Also, there are chances of more candidates to apply, as there may be relaxations in age limit and number of chances. What should you do now? All you need to do now is to be a little more serious and approach UPSC CSE strategically. Don’t waste time. It’s time to start your intense preparation. The implementation of these changes depends on the review by the Supreme Court, and if the Court declares the new Act as null and void, situation will change to what existed before. 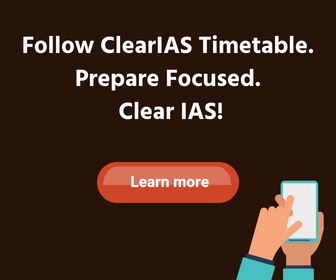 You will get more clarity once the UPSC Civil Services Examination 2019 notification is out. It will be released soon. All the best! It is high time that each and every individual understand that reservation will only dilute quality in all sectors. There are already many cases of lack of quality like doctors, teachers, lawyers etc. In fact, every common man should say no to quota and not give any politician leeway for corruption under the pretext of reservation. All professional courses should only be merit-based. There should be a provision in terms of financial aid or any other aid to help reserved categories rather than any reservation. but another fact is that there are socio-economic situations in India that demand reservation. Is there any age relaxation for those who are in EWS in general category? After implementing ews reservation, any changing will be happened the age of general category candidate? I feel ..Suppose A B C D castes which includes general category also constitute 26% 24% 30% and 20% of population they can be given half of it I.e 13% 12% 15% and 10% as economic reservation for the poor in those castes and rest 50% left to merit. If i apply for EWS then can i also fight for general merit seats (because if not then cut off of ews may exceed the general merit cut off)?? Yes, everybody can compete in General Merit Seats – apart from the reservation quota. Can a ews candidate also fight for general merit seats (otherwise its cutofff will exceed the general cut off)??? Sir, mere father government employee class 3 he..or uniki salary 9 lakhs ke karib he to kya me isme apply kar Sakta Hu??? 1. Will there be relaxation in cut-off marks for the EWS reserved candidates? 2. If you are not able to provide the required EWS certificate in the mains examination, then will you be disqualified or be considered in general category(i.e. Non-reserved)? P.S. The 2nd question is due to the ambiguity in getting the certificates from competent authorities. Will be of great help if you provide me with answers. Is ews candidate only get ews seat,? I mean a person belongs to ews, can he get general seat as well? Yes, EWS can get General Merit Seats as well. General Merit Seats are open to all. I disagree as according to the supreme court, an increase candidate can’t compete in general category even if he’s scored more marks than a general category candidate, once the seats in OBC are done!! I belongs to general category and I applied an application form to prove that I belongs to EWS category. They reject my application by saying that the fourth criteria they mentioned was not against me. It says that RESIDENTIAL PLOT IN OTHER THAN NOTIFIED MUNICIPALITIES NOT BE MORE THAN 200SQUARE YARDS OR 4.12 CENTS. What a ridiculous criteria they prefer, even those who has 5 acres of land and income below 8 lakh per annum and residential flat not above 1000sq.feet in rural areas and residential plot below within 4 cent. This is totally absurd. I m from kerala and here most of the people’s live near their agricultural land and most of the candidates in UR category cannot be able to apply as EWS candidate because of this last criteria. We lost our chance of 10% of seats from UR category and this is totally absurd and not acceptable. This amendment is simply to aquire votes in election. can i apply under ews?????? Age relaxation is possible using EWS certificate ? also how much age relaxation is possible using EWS certificate ? My family has 3 lakh annual income. And has exact 5 acre land. Can i apply for ews category? The system of reservations in spite of its noble objectives has created a new category of citizens whom I call”State orphans”.They are the ones without any reservation or other benefits of compensatory discrimination/affirmative action.If the Constitution is applicable to all,and there is equality before law,why should the strong pre-conceived notions and vote-bank politics render a sizable section of Indian population helpless in every sense.Why does the statistical expertise of certain people target those sections as if they have been responsible for all kinds of discrimination in India?Is not 70 years of reverse discrimination sufficient to rethink on the effectiveness of reservations in India?A good beginning has been made through the 103rd Constitution Amendment.Let not the selfishness and parochialism of the beneficiaries of affirmative action come in the way of ensuring substantial equality in India. If no any seat available for EWS Category in admission of any college, is possible to takes admission for EWS Category person in general category seats?